A few years ago, I made a drawstring bag for one of the boys I was then babysitting to carry the paraphernalia for his cochlear implants. Over the summer his mom (who is also my friend) asked if I could make him a replacement since the old one was starting to look worn after years of constant use. I knew I had nothing in my stash that was school age boy appropriate, so off I went fabric shopping. Oh, darn, right? 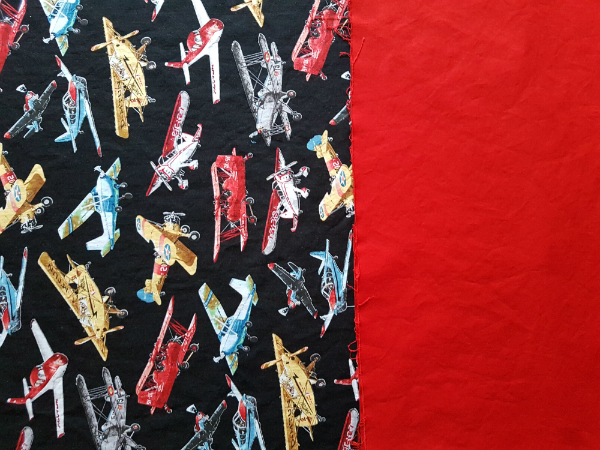 I picked out these planes, which I love, and the coordinating Northcott red solid for the inside of the bag. I used Jeni B. 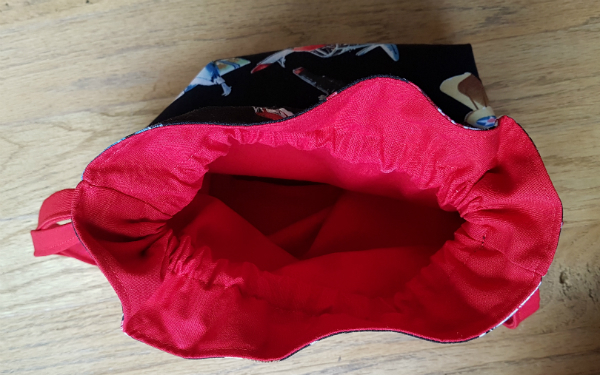 's lined drawstring bag tutorial and I think the whole thing only took me a morning to make. 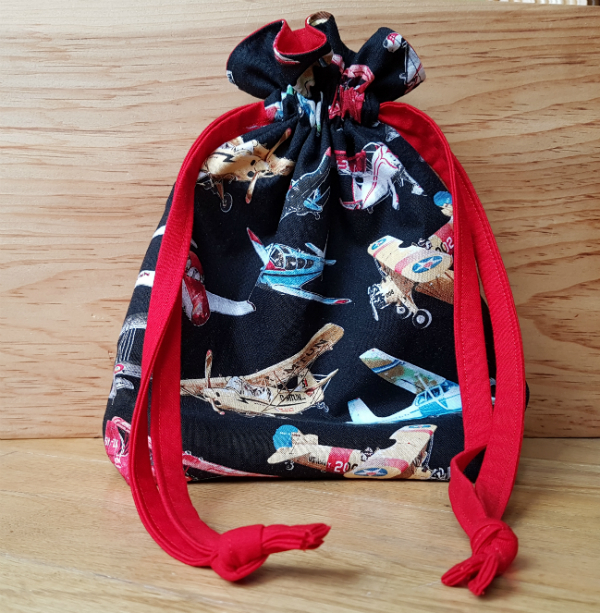 I chose to make the outside of the bag using only the planes fabric so the planes could really shine. I think the bright red drawstrings are fun, too. I love the red lining the bag, too. I'm thinking he won't outgrow the planes before the bag starts looking worn like the old one did. Of course, if he does, I could always make him another one! I'll be away this weekend, but I'll be sure to check out all of your finishes early next week. Have a great weekend! Today I finished eating the butter tarts and finished filling 4 blue bins and one garbage bag and even got someone else to take it out. I am off to Upper Canada Village for a quilt show and I am going by train. Lucky me. I plan to do some serious stitching o the 6 hour ride each way. 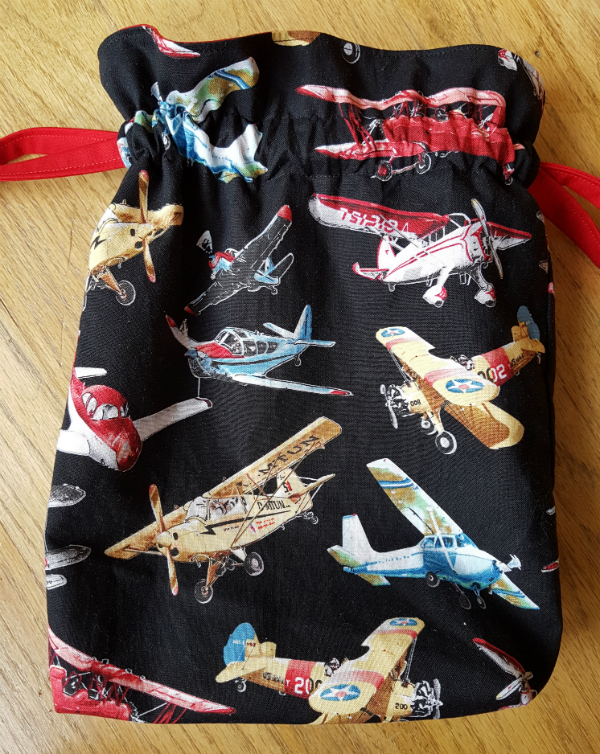 That is such a cute bag, especially with the planes! I love seeing these drawstring bags! Anja has made a bunch of those of Jeni's tutorial. Yours is perfect for him and I love that red pop of lining too! That is a really cute bag. I know he will enjoy it!